I recently had the chance to drive a Honda S2000 -- and now \u2026 I get it. There's a used Honda for everyone. $20,000 goes a long way in the used convertible market. Before I went searching for today's Autotrader Find, I would've assumed that the highest-mileage Honda S2000 on Autotrader had something like 150,000 miles. It doesn't. This 2001 Honda S2000 is the highest-mileage S2000 on Autotrader, and it's done an amazing 230,000 miles from new. 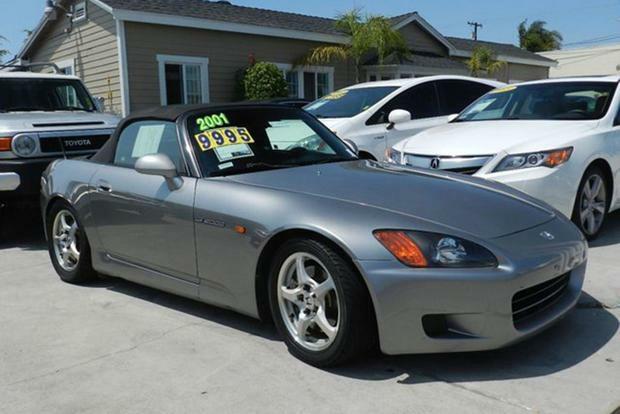 Offered by Deluxe Auto Dealer in Orange County, California, this 2001 S2000 is silver over red with all the traditional S2000 bits: convertible top, manual transmission, slightly lowered suspension... and a 230,000-mile odometer. Interestingly, despite the mileage, the $9,795 asking price doesn't make it the cheapest S2000 on Autotrader. Then again, maybe it doesn't deserve to be the cheapest S2000 on Autotrader. Although its mileage is, indeed, rather high, it looks like it's never been modified or seriously abused -- and the interior and body look pretty nice for 230,000 miles. Perhaps more importantly, the Carfax report shows both no accidents and an enormous amount of maintenance and repair work performed by the prior owner over the last seven years. It also helps that this S2000 is a lifelong California car, which means it's probably never seen a real winter. The real question I have, though, is: How could you possibly drive 230,000 miles in an S2000? While I completely understand that the S2000 is an enjoyable, exciting vehicle to drive, do you really want to be driving it more than 15,000 miles a year? Presumably, that means prior owners used it for long commutes, heavy traffic, errand duty and a lot of other activities for which the S2000 isn't perfectly suited. Still, you have to applaud the previous owners of this car. You also have to applaud whoever buys it next, because they'll probably be heading into largely uncharted mileage territory for the S2000.